With the publication of the entire series of lectures at the Collège de France—the last, Théories et institutions pénales (1971–1972) just released in May 2015—it is now time to read them chronologically: to grasp the overall project of those lectures at the Collège, to discuss the full trajectory, and to continue to excavate our own “pistes de recherche” building on Foucault’s. 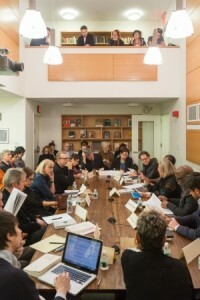 The Columbia Center for Contemporary Critical Thought and the Society of Fellows in the Humanities at Columbia University, with the support of the Maison Française, the Institute for Comparative Literature and Society, and the Department of Latin American and Iberian Cultures, are delighted to offer these 13 seminars on the 13 courses. The seminar series—Foucault 13/13—extended over the full 2015–2016 academic year at Columbia University. The seminar series were open to Columbia faculty, fellows, and students, as well as faculty and students from other New York universities. The seminars are now available on-line, including both the full AV recordings of the sessions and the articles published by all the contributors. Please click above on the 1/13 through 13/13 tabs to see each individual seminar. Welcome to Foucault 13/13! Each seminar was led by distinguished scholars from different disciplines. The seminars took place on Monday evenings in the fall semester (2015) and Thursday evenings in the spring semester (2016) from 6:15 p.m. to 8:45 p.m. For more details, visit our schedule page.